Instrumentation is the study, development, and manufacture of instruments, as for scientific or industrial use. Instrumentation gears are based on modular concept. They include spur gears, segment gears, anti-backlash gears, worm and beveled gears made of materials including aluminum, bronze and stainless steel. These are provided with or without hubs and are best suited for instrumentation and power transmission in light duty and medical automation fields. 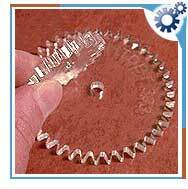 Instrumentation gears are manufactured using high accuracy gear cutting equipment. Standard gears are produced in stainless steel, hardened stainless steel, aluminum alloy an brass. Stainless steel is used when maximum corrossion resistance is required. Aluminium offers reduced inertia and good corrosion resistance when anodized. Hardened stainless steel offers remarkable combination of high strength and hardness. Rack gears - Used to turn the dial that display weight. Pinion gears - Are used for accuracy evaluation. Spur gears - Used to determine the direction of the principle axis. Bevel gears - Used to redirect the shaft from the horizontal gas turbine engine to the vertical rotor. Worm gears - They offer corrosion protection.